This is a guest post from Nada Bassyoni, a 2017 honors graduate of Northwood High in Irvine, California. She recently spoke at a state hearing chaired by Senator Holly Mitchell about implicit gender bias. For the past four years, you have watched your teenager fight through AP classes and waste summers with SAT prep courses. Hours upon hours of studying in dark rooms behind shut doors. Finally, the moment of truth has come. The whole family gathers around the dining room table for the big announcement. Where did your millennial decide to go to college? You want to flip tables, throw a riot, or stage your very own Toddlers in Tiaras tantrum. 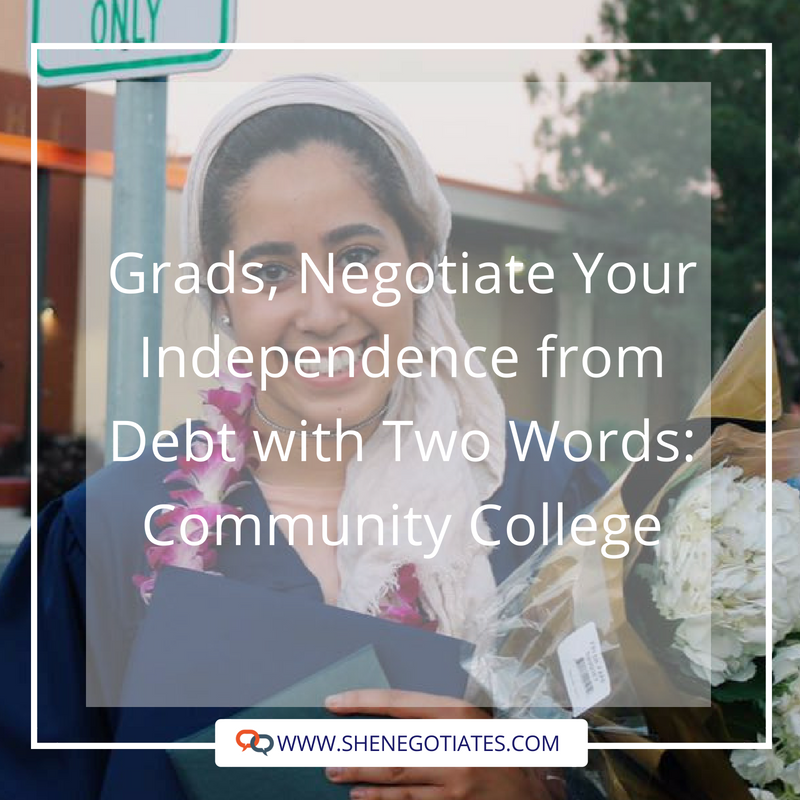 I know a four-year college is what you dreamed about for your first-time college grad. Take a deep breath. After reading this article you’ll be begging your other kids to do the same. If your kid is as smart as you know they are, community college will not be their final destination. Many community colleges offer admissions agreements with public universities that allow ambitious students to transfer their credits toward a bachelor's degree. My local community college, for instance, has transfer agreements with the prestigious campuses of the University of California as well as the first-rate California State college system. Because a college degree has become a “must-have” asset for entry-level jobs, there has been a surge in applicants seeking admission to the best institutions of higher education in the country. Between the straight A’s, perfect SAT scores, extra-curricular activities and “overall excelling persona” of your hard-working high school grad, the bar has been set high, making a first-pass rejection by your student's dream college less certain than ever. Not to worry. The alliances community colleges have made with prestigious four-year universities, together with transfer credits, can make your adolescent's dreams become reality in two short years. Money (I wish it grew on trees too). Forty years ago, thirteen weeks of a median household’s income could cover one year of tuition. Not anymore. Now, the average household has to spend a year’s income to cover a year of college. While community college may not completely fix the problem of pricey universities, it will definitely cut the price in half (have you checked? I’m pretty sure it’s a LOT more than half). Let me talk to your student for a moment. You go around begging your parents or friends for a couple bucks until you eventually get the remaining $75. Ultimately losing the independence you’ve been pledging since you turned 18 or becoming that friend. On the other hand, you could wait a couple months until the shoes are on sale for $50. You’ll still be $25 short but it’s an easy price to pay in comparison to the $75 you would have had to scavenge for. The same idea applies for college whichever route you decide to take, you will inevitably end up in debt. The important question is just how much debt? Do you really want to be paying off your student debt for the next thirty years when marriage, children, and your own home might be on your mind? Yeah, I didn’t think so. At seventeen years of age, your youngster may still not know what she wants to study. Who does at that age? And how many fields will be outmoded or over-populated by the time she graduates. Among the AP classes she took just for the GPA boost, the mandatory areas of study and the easy A subjects, your cherished child may have missed the one class that would open her eyes to a bright and satisfying future. Fear not! Community college could be the chance for your student to explore her interests through volunteer services and internships. These opportunities will allow your young one to stand out among other applicants at the university they’ll transfer to at the end of their community college studies where they’ll fulfill the same general ed requirements at a fraction of the cost charged by a Prestige U. If your child decides she suddenly doesn't want to be the doctor-lawyer-astronaut she set out to be, it is much easier and less expensive to change course between her sophomore and junior years. As much of a disappointment it might be to watch your child’s peers head off to Harvard, Yale, Stanford or Berkeley, between the frugal community college enrollee and the privileged university student, there should be no arguing about who made the better choice. Remember: slow and steady wins the race!